time to have a look at the books I brought home with me from my travels. The first event out of San Diego was that I had to take them all out of my case, as it was overweight, and make them my hand luggage. All twenty lbs of them. 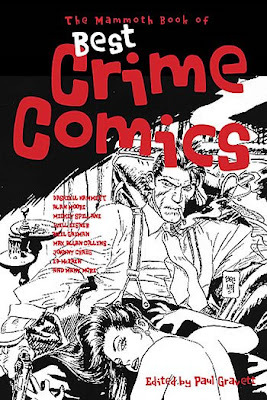 First up, The Mammoth Book of best Crime Comics, edited by my dear old pal Paul Gravett, so you'll get no unprejudiced view from me. In fact I just found, and am stealing, this handsome photo of the wee chap. Best Crime Comics: I don't enjoy having comics broken up into genres like this, though if I was in Paul's shoes I certainly wouldn't hesitate to get a gig contributing to the 'mammoth book series.' I would say that comic books as a subject in itself is the genre, and anything else is a subdivision of that. In the world of popular fiction it makes more sense to categrorise things by genre, where you have writers devoting entire careers to one idiom, whether it's fantasy or crime or science fiction etc. and you can trace clear lines through time. There isn't as much mixing it up in that domain as there is in our comic book world. There's a 120 day run of Secret Agent X-9 from near the beginning in 1934 when Hammett was still writing it. One appeal of this selection is to show what action strip cartoons looked like before cinematic style was introduced. Everything is staged at medium distance. It's good tough stuff, though lacking the invention of Hammett's best short stories. While the book overall is of the type that I usually feel tempted to cut up and rearrange according to my own principles, one other thing I found exciting. 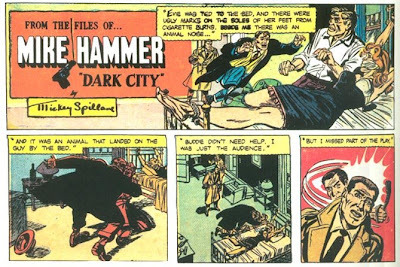 A sixteen week run of Mike Hammer Sunday pages from 1953/54. The page for Jan 31 has piqued my curiosity. In his introductory note Paul tells us that the bound and gagged girl in the negligee, being tortured with cigarettes to the feet, attracted moral indignation that led to the title's cancellation. The page he reproduces is different from the version of the same page that appeared in The Comic Century (KSP 1995). I show the upper halves of both (The lower parts are identical). In Paul's version, the black and white, the panel seen in the colour version has been replaced by an enlargement of the final panel of the previous week's instalment and the torture is hidden behind the title box. I would tend to think that an individual newspaper had taken the liberty of making the change except that panel 4 in the altered version (the b&W) doesn't appear at all in the other. Could the syndicate have asked the artist to supply two different versions of the page? Can anybody shed light on the matter? Paul tells us that a diappointed artist, Ed Robbins, quit the comic strip business. His Hammer boldly anticipates the graphic style and permissiveness of the hard-edged British strips of the sixties, of Holdaway on Modesy Blaise and Horak on James Bond . I was featured recently in The Mammoth Book of Best Horror Comics (not a Mr Gravett production), which you possibly don't want to know about. In there under false pretences since my contribution was more sequential illustration than comic strip. I waiting now for someone to do The Best Book of Comic Mammoths, fun and frolics with everyone's favourite hirsute proboscideans. Ok, that's my bad joke for the day over and done with. At least two people claimed that he was able to speak in comprehensible English. ...so at least we know he wasn't a Scot, and therefore not one of your ancestors. 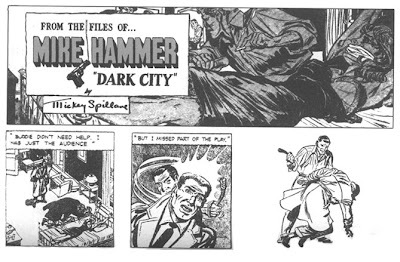 You asked me to weigh in on this Mike Hammer page, so I checked my own run and my tab page matches the color one you reproduced. My guess is that the difference is simply due to reformatting for a different size (Hammer was definitely available as a half-tab and most likely a half and third). If you're telling us, though, that both pages appear to be in tab format, which is impossible to tell from the portions you reproduce here, I suppose the reformatting could be for the European market, for which the tab size might be a bit different (sorry, my knowledge of how things work over there is pretty much null and void). I very much doubt that this reformatting could be the result of a newspaper editor being offended and having the page reformatted in-house -- the reformatting would definitely not have been so artfully done -- it would be more obvious. And what, after all, is the problem with showing her feet? The color version shows no visual evidence of any active torture being done or any marks on her feet -- we only know what's going on through the caption. An offended editor would more likely have just blacked out that caption or had it relettered. If Phoenix Features had offered alternate versions I would expect the same -- change the caption because the art certainly wasn't made more acceptable. The bound and gagged woman is in itself more than enough to raise the hackles of any perusing grannies, especially at that contentious time in the history of comics. Does panel 2 in the colour version appear in the b+w? The colour panels seem more consistent, somehow. no, panel 2 is dropped in the reformatted version. Except that there is more than just reformatting going on here. in fact I don't think there is any reformatting. Both are full tabloid pages as far as I can see. Apart from one panel being substituted, another disappearing altogether and two captions being deleted, a whole new panel appears in the second version (it might have been clearer if I'd put the black and white one after the colour since the colour is clearly the original version. One panel is dropped and a completely new one is added. The question is: where does the new one come from? Was it drawn specially? if so it makes for an interesting proposition: while not on the scale of Walt Kelly's 'bunny rabbit' strips, where the artist creted a whole week's worth of alternative strps for papers that turned down the controversial material, it is highly unusual for a syndicate to offer such an altered version of a strip. i.e. the original artist, or an artist at the syndicte office, has cut out a whole panel and inserted, at a different place in the sequence, a completely new panel. That panel which is by Ed Robbins is brilliant. The eye situated above the gun sight and the muzzle flash, the strong lines that form and shape the hand and the hair, it's all bloody good. The best thing though is that he is actaully shooting the viewer. There is violence going on here, but we can sympathise (empathise?) with the victim because we are looking out from the victims eyes. Does the book mention why he was disapointed? 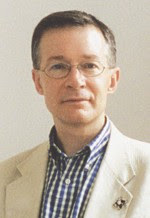 Or was it the general maliase that affects artists whose name is ed, eddie, or edward (most of my favorite artists have the ed name; edward lear, eddie campbell, edward gorey)? that's Horak's james Bond. I didn't label it because I figured everybody knew that. Or is everybody just reading in an awful hurry today? Didn't read in a hurry, just assumed it was Ed's because Ed Robbins seemed to be the main point of the paragraph above the picture. 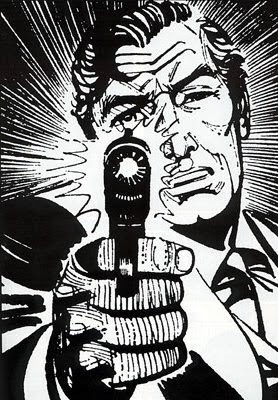 I didn't recognise the drawing as James Bond (obvious now), and not being an expert on comic strips (or comic books for that matter)can't tell the difference between Horak, Holdaway or Robbins. For those who have a fair amount of knowledge of these things (probably everyone else who reads this blog) it would probably have been quite obvious, but for someone with my vast ignorance it wasn't. I've copied this onto my main page for 28 november.